What’s in a name. Would lava by any other name smell as sweet? Perhaps that is not the right question: lava is many things, but sweet-smelling it is not. It smells like a rose bush that was doused in some evil sulphurous pesticide and then put on fire. This rose also constantly explodes with a roar well above the legal maximum. No, Shakespeare’s rose is definitely the wrong analogy. The course of true lava never did run smooth. But in geology, names are everything. The number of different minerals is staggering, and each has a different name which normally reflects its point of discovery rather than implying anything about the composition. Olivine has nothing to do with olives and perovskite is not a rock band. Do you know your cryolite from your kryptonite? How is your appetite for apatite? Studying geology must be like learning Inuit. Volcanic rocks share this nomenclaturic nightmare. What on earth is rhyolite? What happened to komatiite? And what stuff is tuff? Even google can get confused: ask for amygdale, and it gives the right definition but images of something completely different. At least it knows not to show images of amygdala (which might require that you confirm your age). But for all of you who were confused but afraid to ask, here is help. This post gives all you need to know to understand the variety of rocks from lava, or at least help you speak like you do. Welcome to the club. We all bluffed our way into geological volcanology. Lava is molten rock. At the end, it solidifies back into rock. So you should get back what you started with, right? Wrong. Just imagine a block of ice. Melt it, vaporize it, and let it condense and freeze, you may get snow. Both are solid water, but that is all they have in common. So too with rock, although with much more variety. So let’s have a look at why not all lava is the same. For most of the images, if you click on them you will get full resolution. All the poor ones are from my own collection. The type specimen of volcanic rock is basalt. It is effectively mantle material, which was melted at the bottom of the crust, ejected from a convenient hole (also called a ‘volcano’), flowed downhill for a bit and solidified there. You are looking at displaced mantle material. Most of the ocean floor consists of this stuff. It is heavy because the mantle is made of denser material than the continental crust (if it weren’t, the crust would sink down like an overweight iceberg and continental existence would be short-lived). In practice, the density of basalt is close to 3000 kg per cubic meter. The continental crust is typically around 2700 kg per cubic meter. Basalt is the ultimate volcanic rock. Why doesn’t every old lava flow look like this? There are a number of reasons why not all lavas are the same. The stickiness is also called ‘viscosity’. Higher viscosity means stickier, i.e. more reluctant to move. So in what way is lava like honey? Should I call my loved one ‘lava’ or would that get my fingers burned? Well, lava is also a mix of substances, and these have different melting temperatures. As lava cools, some substance may come out of the liquid and crystallize. As more and more crystals form, the lava becomes less runny and more sticky. And this gives rise to the two Hawaiian words used to describe lava flows: Pahoehoe and A’a. Pahoehoe is the thinner, runnier lava that happily covers large distances and creates smooth lava flow which afterwards you can walk on. It is the hot honey. A’a is the sticky lava that refuses to go anywhere fast. It forms very uneven surfaces and is a nightmare to walk on (even after it has cooled enough). Its surface will shred your shoes – this is the one place on earth where high heels may give an advantage. A’a is the honey that has been kept too cool and really would have needed a few seconds in the microwave. In Puna, the early eruption brought up lava that had been in storage for decades – perhaps centuries. Even though it had stayed warm (a kilometre of rock insulates pretty well), it did not stay hot. This became the sticky stuff, with high viscosity; this explains why the initial eruptions did not produce much in terms of lava flows. It built walls – not roads. Later, the new lava arrived and this was much hotter. The hot, new, all-running and dancing low-viscosity lava ran like runny honey and in no time covered huge swathes of country side. Even though both are basalt, the two behaved very differently. Poor Puna. Let me divert for a minute. Lava contains a mix of elements. The main ones are iron, magnesium, silicon, and some other things such as aluminium (called aluminum in Trump land, a spelling that was in use in the UK very briefly but was introduced to the US through the Webster dictionary of 1812.) Each of these forms minerals (mainly oxides), and each mineral has a different melting point. Hot magma contains all these elements and their minerals, although not always in the same ratios. But keep magma for a while in a storage facility (also called a magma chamber) and it begins to cool – very slowly. The first minerals to hit their melting points are iron and magnesium oxides: they form crystals and drop out of the solution. Beforehand, the magma was called mafic (for magnesium (never to be called magnesum) and iron). Now that iron and magnesium are becoming depleted, it is called andesite – you may remember this word from Puna’s infamous fissure number 17. Store the magma for even longer, and you are left with mainly silicates, mixed with a few other elements (aluminium, calcium, sodium). This is called felsic lava (the word ‘silicic’ is also used). Rhyolite and dacite are of this form. Dacite has made an appearance in the recent Puna stories, albeit only found in deep (geothermal) drilling and not on the surface. You can expect that this will form a sequence in temperature: mafic lavas are hotter and thus less viscous, andesite is cooler and stickier, and felsic lavas are positively cold (as lavas go) and nearly immovable. And for the most part, you would be right. Mafic flows – felsic stalls. There are a few exceptions: sometimes magmas form by melting rocks that themselves already lack certain elements. For instance, imagine a rhyolitic magma chamber solidifying into rock. Long after, heat finds its way to the rock and melts it: the new magma will have the composition of rhyolite, but it could well be much hotter than usual, and therefore far less viscous. You can now get a rhyolitic pahoehoe, and this is for instance found along the Snake River in Trump land. Iron makes the world look black. That is true in lavas as well: mafic basalt is dark to black, while the andesite is greyer and the rhyolite is a bright lava. Of course, add oxygen and over time iron turns red, like the soils of Oklahoma. I should point out here that the world of lava is simpler than it used to be. A few billion years ago, the mantle was hotter than it is now and therefore lava was considerably hotter as well. This gave a type of lava that is ultra-mafic, an extremely magnesium-rich, which is called komatiite. They don’t make it anymore. So temperature is important. But how quickly the temperature goes down is also relevant. Lava rocks that solidify fast look very different from ones that cool only slowly. The rate of cooling has three different effects. On land, cooling is slower. Thin flows on the surface cool faster than thick ones. In the picture, the difference between the thin flow in the foreground and the thicker ones in the background is notable! The former solidified fast enough that the flow patterns froze in. An extreme case is that of liquid droplets flying through the air. As they cool they solidify, and form long streamers. This creates the strangest rock of all, with the evocative name of Pele’s hair. You have to feel sorry for her hair dresser! What kind of comb would be needed? This lady is not for brushing! Pele’s hair can be found especially around lava fountains. But beware: the hair strands can be needle-sharp and should be handled only with thick gloves. So much for the first of the three effects. The second one is very different: this is when lava is cooled so quickly that it briefly forms a supercooled liquid, i.e. a liquid below its melting temperature. You can create this yourself by putting distilled water in the freezer. It will remain a liquid even though its temperature drops far below freezing. But disturb it ever so slightly, and it freezes over instantly. If you do this with molten rock, and let it suddenly solidify well below its melting temperature, it can create a glass. (The temperature below which this can happen is called the glass transition temperature, which is different for each material.) The trick is to make it solidify all at once, with as few separate crystals as possible. An easier way to do this is by starting out with a lava which contains a bit of water. Water lowers the melting temperature, and so the lava can be cooler whilst still a liquid. Now evaporate the water (as can happen as the lava becomes exposed to air). Suddenly the melting temperature goes up, and the lava finds itself caught out, being a liquid well below its new melting temperature. A well-known example of a rock that formed in this way is obsidian, a black rock of volcanic glass. It forms from silicate-rich melts, i.e. from rhyolites. Obsidian was sought-after in the stone age as it can be used for cutting (including the careless owner). It should be harder to make a glass out of basalt, because it is hotter to begin with and readily forms crystals while cooling. But Hawaiian volcanoes manage it quite easily. Basaltic glass is called tachylite. It can be a thin edge on a crystallized lava flow, but on Hawaii it can form thick layers. And now you will not be surprised to know that Pele’s hair also consists of strands of this glass. Ouch again. Perhaps the most dangerous of all is when lava meets the ocean. The instant cooling forms small particles of glass, and the rising steam carries them away. The white plumes of Puna, where the lava comes over the sea cliffs, are pretty only from a safe distance. There are several reasons why you shouldn’t breath in the stuff – the tiny glass particles among them. The third effect is that of crystallization. As lava cools, crystals begin to form. The slower the cooling, the larger the crystals can become. These crystals (or their absence) are easily recognized by eye. Compare the following wo rocks. Both are obsidian, and thus formed through rapid (instantaneous) cooling. The left one looks ‘normal’: a hard glass, albeit with a greenish tint. The one on the right contains a host of crystals, a feldspar to be precise. What happened? It spend some time cooling slowly, allowing the crystals to form, before it suddenly cooled very fast and let the remainder turn to glass. The texture shows that it cooled in two distinct phases, one slow, one fast. The next one is pitchstone: also a rhyolitic glass, like obsidian, but containing a larger fraction of minute crystals. It gives the rock a dull appearance. The crystals are very small, and this shows that the initial cooling was fairly fast. Pitchstone contains a bit more water than normal obsidian, and so the rock has a lower melting temperature. The various minerals with the highest melting temperature had time to form small crystals before the remainder turned to glass. And finally the other extreme: this is a rock with enormous crystals which must have cooled very slowly. In fact this particular rock, a pegmatite, would have formed in the deep crust, where the cooling was so slow that the single crystal could take centuries to form, before the surrounding magma finally turned to stone. Now we know what volcanic rocks look like. But often, volcanic rocks look very different, striated or welded. They also come in a range of sizes, from the island-sized flows of Mauna Loa to the ash of Mount St Helens. What causes that difference? Fragmentation of the lava comes mainly from explosions. Rock does not easily explode, of course: it lacks suitable chemistry, and lava is nowhere near hot enough to vaporize rock. The explosions come from trapped volatiles. Big explosions come from volatiles in magma which suddenly decide to become a gas, need a thousand time more volume for this, and end up blowing apart complete mountains. But it can also come from trapped vegetation underneath a lava flow, or even in one infamous incident, trapped snow. These kind of explosions produce flying lava bombs – the name is not entirely accurate, as the bombs are ejected by the explosion – they do not explode themselves. The explosions produce fragments of a variety of sizes. They are distinguished by size. Particles smaller than 2 mm are called ash. Up to 6.5 cm it is lapilli. Above that size it is a lava bomb. All together it is called tephra. What goes up must come down – as true in volcanics as it is in politics. It is important to know that a lava bomb is made of lava – it will happily start a fire if it lands on flammable material; the danger is not just in being hit by a projectile with the size and speed of a cannon ball (although that is not entirely without danger either). They can be as large as 5 meters (although 20 centimeter is a more typical size, luckily), be ejected at a speed of 200 meters per second, and can travel considerable distances through the air: up to 5 kilometers. Lava bombs may also arrive as tachylite. Ouch! Smaller fragments travel further than large ones because they benefit from the lift from rising hot air of the eruption. These fragments also are much more voluminous, and the ash can cover large areas in a blanket that is centimeters to meters thick. It welds together, either through heat or over time. The welded layer is called tuff. The name is not fully appropriate because it is the softest rock created by volcanic eruptions. The tuff can embed lapilli fragments and even lava bombs if not too far from the eruption site. Whereas the lava bombs have the composition of the lava, the tuff will often have a composition close to that of the mountain. If lava, it is often rhyolitic (because that explodes well). Tuff is often light coloured, and can be almost white. The best place to find tuff is in local buildings: it is everyone’s favourite building material. Although, be aware, if your local buildings use it, somewhere in the area is a mountain which made it, and which may have its own building demolition program. The tuff in this image is layered between lapilli (which falls first) and ignimbrite, which is debris from a pyroclastic flow. The tuff can be recognized by its smoother texture. The final piece of the puzzle is the gas content of the erupted lava. If the gas content is high, the lava becomes frothy, and when it solidifies it has lots of holes, like a swiss cheese. There can be so many holes that the rock weighs less than water, and floats: this is called pumice, and it forms especially well after an underwater eruption where the water provides more gas than the lava can cope with. The sea can become covered by rafts of pumice kilometres wide: after Krakatoa, they made local sea travel almost impossible for months. If the stone has lots of holes but not enough to float it is called scoria or cinder (the two words are interchangeable; ‘cinder’ is older). This is where Cinderella got her name from. (No, I don’t know either. And nowadays she would be called Scorella.) These form especially during volcanic explosions as the gas-rich lava is shot out from the vent. But gas bubbles can also form underground, and leave magma that solidified under ground with holes. Over time, the holes may become filled with water and the water can deposit new minerals, often a calcite. These rocks are called amygdales. But it can get even better. The rocks can have very large holes inside, and over time, anything can happen in those holes. Open the rock and you may have the surprise of a life time, with wondrous crystals and colours. Here is an example, an oversized amethyst. What causes the different colours? That, my dear Watson, is elementary. But the science of volcanic gems is a different topic – a different post, perhaps. Skrillex wrote the opening music? I guess it beats a fake Ecstasy of Gold. The lava field is now 14.2 km2 in area. A lava flow has also gotten to 2.2 km from four corners as of 4 hours ago. One lobe of that flow is also going northeast, so it has sort of gone into both drainages. The lava has crossed railroad avenue, just up from the 1960 cone. Seems like it has surged a bit today after slowing down a lot yesterday. It looks like it will go between kapoho crater/green mountain, and the 1960 cone. That is only the most far advanced flow though, there are 3 others going more east and northeast along the line of descent that was originally expected. It appears that the eruption rate is more than high enough to feed all of them so this could be very interesting. It has been erupting this way for about 5 days, and erupting new lava for 2 weeks. At this point the eruption more resembles 1960 rather than 1955 so if it goes along this path it could be erupting the way it is now almost continuously for another month, and it is still very possible for it to get much bigger than it is now. HV mentioned that the lava channel had build up a levee and there was a risk that it would break out. If that happens the current flows could stall. One would hope that they do before they get to the villages. The flow rate will depend on the gradient but I think it only flattens around four corners. Im more interested in the developments at the vent, earlier today the fountain became a dome fountain, still with a huge volume but not really high. I dont really know why it did this, but it was only temporary by the looks of it. The cinder cone is getting really big too, even though it is only 4 days old. 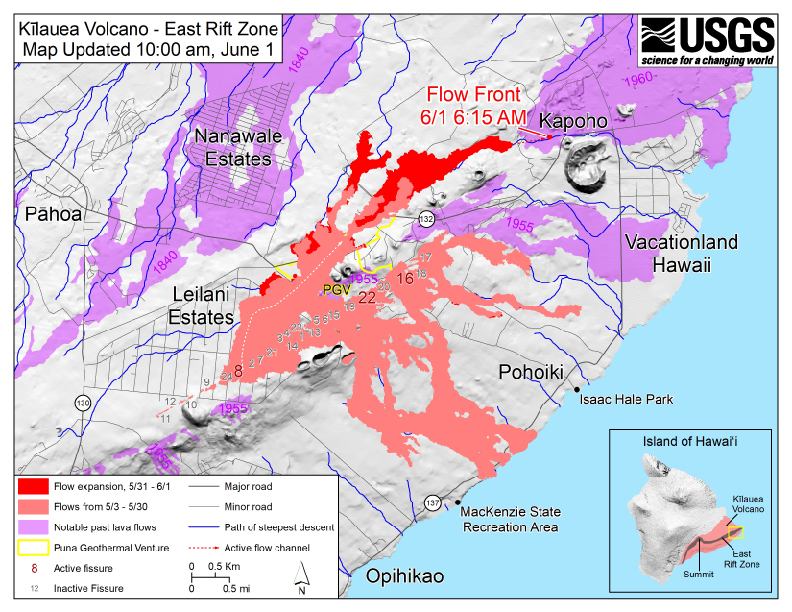 A breach in the levee would also not really stop the flow that much, it would stop the flow to kapoho but not the threat of lava flowing to the north. There was also a pretty big overflow a while ago that didnt really do anything to stop the flow to the east. I dont know why HVO wont put a webcam near kapoho, it basically means we cant see the active lava until someone goes in the area, which is once or twice a day. It also means we cant see about 2/3 of the fissure either from where the webcam is. I also dont know why they only upload a few pictures of the area and often not of the areas that they are talking about in the updates. I also just measured the distance along the steepest descent between railroad avenue and four corners and it is 0.8 miles. HVO have reported that the flow is moving slowly still at around 1.1 miles from four corners. This means either HVO got it wrong before when identifying the street, or the flow is going around the north side of the 1960 cone. If it is the second option it really shows that the lines of steepest descent on the maps are really not that reliable. Given its very slow advance between 10 pm and 1:30 am, it is possible that lobe has stalled out and other flows further north are gaining more of the supply, as the flow in the webcam is still at least as big as it was before so I dont think anything is slowing down. I love the phrase ‘anorak’ and use it for the snob factor; while also aware of the irony of me being a storm chaser, trainspotter (‘foamer’ In the U. S.) as well as a volcano geek! May be lots of reasons why it is not so easy to install new cameras. Lack of time – this is pretty far from their home base. Lack of power. Lack of access. But a possible reason in that area is lack of permission. The land is privately owned and there is a good deal of suspicion among the locals of any government (or non-government, for that matter) organization. Also it would still be advantageous to put a webcam near kapoho so the residents can see what is happening. Last night view picture, the fountain is still going strong. And first colour picture, hard to see but the fountain is definitely there. Back to the UK the Daily Mail have reported scientists have found 2 fault lines under London which could cause earthquakes. ?? If it’s in the Daily Mail, I now doubt the very existence of London. ”The Imperial College researchers found the fault lines using a type of radar imagery called PSInSAR (Persistent Scatterer Interferometric Synthetic Aperture Radar). This is a developing technique which is widely used to detect and monitor the moving of the ground, especially in urban settings. Dr Ghail’s research focused on the detection of smaller scale ground movements (of a few millimetres). The team used the London PSInSAR dataset, which combines images from an archive spanning 18 years (1992 to 2000 and 2001 to 2010). From this they detected a pattern of movement that suggested two previously unknown fault lines exist in the capital. I can only hope the faults run right under the Mail’s HQ and it disappears back into the sediment and detritus from whence it came. Steam has stopped at the vent at Kilauea summit for the time being. at what time did the steaming stop at Hawaii time?? Still heavy steaming on the Webcams I am checking. Did you snap a screenshot. Ive been waiting for a opening to see the changes to the caldera floor? We lost the overlook cameras during the current activity. I have not seen the floor of the Caldera in over a week. When I say no steam, I meant the heavy billowing clouds, hoping that they could get a drone up. Wow! great find. I need to think about this a little. Overflight from Mick Kalber 5/31 in case you missed it. Surely not lava. Surely an interesting trick of the sun. It looks about the same as before to me, no lava. It will probably be very temporary but that would be a very dangerous situation for anyone near the summit as the eruption could be pretty big and involve a lot of ash for a few hours, somewhat like the recent eruptions at ambae only much less prolonged. Given the fact that small eruptions happened within a year of the 1924 explosions and the supply rate now is at least 10 times what it was in 1924 it might not be that long before eruptions restart at the summit. Hey Turtle what did you make of the drone footage up the comments ? I made that comment after watching the drone footage, I’m a bit surprised that the crater collapsed to the extent that it did during this eruption, but it isn’t really the first time this has happened so maybe I shouldn’t be suprised. I guess now we have to wait and see what happens there, as the explosive phase might be over now and nothing will happen until lava starts erupting in the crater again. I guess that the eruption rate could decline at fissure 8 now given that the area around it isn’t inflating anymore but the eruption itself could go for a while longer. It very likely has come too late to save kapoho though, which will probably be overrun within a few hours, the lava is currently just past the gap between kapoho crater/green mountain and the 1960 cone (‘sandfords cinder pit’). I don’t think even HVO was expecting the flow to go that direction from where it was erupted. There is no visible bottom, It has collapsed , no vent. Big glitch at the summit again, with an M4.4 earthquake. The GPS at the summit has stopped deflating over the past day, it seems, unless that is because the output can’t handle more than 1 meter. What happens next will depend on where the water is! If it is stays away from the magma, no problem. Otherwise there could be a more serious explosion at some time. They won’t be reopening the national park yet. Yeah,,, 15 minutes after i went to take my nap…. Was there any eruption(vent clearing) cough?? Looking at the new map, the two northern (western) flows above h132 have stalled (no progress since the previous update). The two below (or east) have merged (filled in the gap between them completely) but the front has widened but not pushed forward much. The only way forward seems to be the flow towards Kapoho. It should rejoin highway 132 shortly. Luckily it is moving in an area without houses, as far as I can see. An interesting video of what is happening at the flow front of fissure 8. Opps wrong link. That was on one to the grand neice. If a dragon wants to send that one to the dungeon for the entertainment of those captive there feel free. This is the one that I meant to post. They have some awesome drone video of the flow front. The best I have seen. Very informative video on what is happening at the summit, as well as some nice visuals. It looks like the crater is about 400 meters deep and 800-900 meters wide and a bit oval shaped. It isnt perfect but I calculated it to be about 225 million m3 in volume, so it would take about 1-2 years to fill at the 0.2 km3 supply rate of the last 10 years. It would probably take about 5 years to fill halemaumau entirely but that is assuming the activity will be stable and continuous which isnt certain at all. I think there is a shallow connection to both kilauea iki and the southwest rift so eruptions could happen there too and stop the filling temporarily. All of that is theoretical at this moment of course. The steam coming from beneath the top layer of lava around most of the circumference of the crater is interesting. It appears to be rising from behind the crater walls. How is that possible? Is there perhaps a ring fault somewhat wider than the diameter of the crater that allows the passage of steam? If so, given the vent is blocked, would the pressure of that steam be likely to cause the walls of the crater to collapse further to the diameter of that larger ring fault? Well there has been a lava lake in that general area for about 7 years so the area is going to be pretty hot. I noticed that too. The steam tells you where the water is and where the heat is. It seems from the video that most of the steam comes from cracks around the crater, near the top. The water may be circulating from deeper, heated in the vicinity of the magma and as vapour pushing its way to the top, or it may only be near the top layer, i.e. from recent rains. The deeper layers seem pretty dry judging from the lack of steam there. How deep the cracks go is hard to tell. I have the feeling that they are shallow. Perhaps there is a permeable layer (rubble?) below the solid top lava layer and the cracks provide a pathway from there. The lack of steam from the bottom is either a good sign (it has dried up – no water is getting in) or a bad sign (the steam is bottled up). . The vents on the bottom were surrounded by a lot of sulfur so maybe that supports the idea of it being dried up and the water being restricted to the surface layers. There was an article about a week ago that discussed the idea that the 1924 explosions were actually magmatic and of the vulcanian classification, which was based on observations that the recent explosions contained juvenile material and the gasses were mostly magmatic. This really makes a lot of sense when you consider that in both cases there was a very big and often overflowing lava lake in the area for years and that would have been too much heat to allow the water table to actually get near the vent. I know water can be held in a supercritical state at magmatic temperatures but not at only 400 meters depth next to an open vent. The much bigger 1790 eruption was mostly steam driven as evidenced by footprints in the base surge deposits leading to low temperature emplacement, but that eruption might have been the first really big summit eruption in a relatively long time (10-20 years, most activity was happening on the east rift at that time) which allowed the bottom of the caldera to become a lake, or at least waterlogged ground. This is a very different scenario to the current one. The current scenario is most likely going to be followed by a few months to a year of quiet and steady inflation then lava will probably erupt in halemaumau again, most likely at the bottom of the pit but possibly elsewhere at the start. This may or may not be the resumption of lava lake activity but the crater will probably fill quickly regardless. It is also possible that lava will erupt at pu’u o’o again, although this big drain of magma might cause the east rift to close shut for a while. The obvious did not occur to me. There are cracks in the top layer of lava near each area of surface steam. The cracks probably collected rain which turned to steam and found its way out under the lava to the lip of the crater, as well as through the cracks..
And while we wait for the next missive from HVO, here is a diversion about life on a mid-oceanic flood basalt. Iceland but not as crowded. The page author did a good job with the java. Its rare that the scripting actually enhances the readability of a page. The bbc do lots of their ‘longer reads’ like that now. I like it. Looks like a lovely land with happy people. i’m charmed. i guess an extrovert would think i was out of my mind; but i can see the rarified beauty of the place and the children’s faces are so happy… looks lovely…. but lonely. Living in a land like that becomes a “Push-Pull” experience…. live long enough there and You can live no where else even when it is the most brutal and difficult. Spirit becomes the challange. Being Faroese, I actually do know a few of those people, it’s a shame that many of the small places are dwindling away, they are by far the most quiet and tranquil places I’ve ever been. If the choise was to made wether to move to the big city or one of those places, I’d go to one of the small islands, there’s considerably more nature and wildlife, and the starry night sky is waaaay better, as well as people are more neighborly. Atm I live in a village on the mainland with around 200 people, so getting sorta the best of both places. It’s a natural evolution for things like this to happen. In the UK an example of this occurring was St Kilda which became uninhabited in 1935. Either the island population dwindles until some kind of calamity occurs, finally forcing matters (as at St Kilda when a large part of the fishing fleet was lost in a storm), or the dwindling continues until the end. Many of the islands around Scotland are suffering similar issues, and the same is true of the Isles of Scilly off Cornwall. I suspect likewise for the islands off the western coast of Ireland. ps…. and it would literally kill me to live in a big city.. can’t take Anchorage for more than 4 days… and when i drive down the Turnagain Arm i can breathe again…..
Iceland crowded? Come visit the Netherlands someday…. Good I hope he’s fined and the drone confiscated..
New post is up! No worries.